So. He's all about racing in Mario Kart. Good! That means you're doing something right as a parent, after all. You grew up with Mario Kart on the SNES and N64, and now they've got souped-up graphics and even more fun with their Wii or Switch. But now, it's time to take the action off the screen. And no, we're not talking about taking a screen time break. We're talking about bringing the action into the real world! 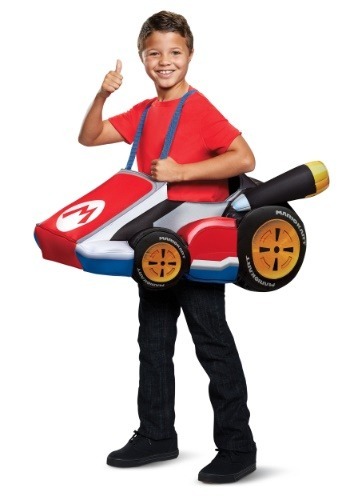 That's right, what once might have been left only to your imagination, can now be made a reality when you get your kiddo this Super Mario Kart Child Mario Ride In Costume! It's fun, it's fast, it's decidedly Mario! It is, naturally, styled just like Mario's classic Kart, but that doesn't mean he's limited in character choice. You can just check out some of our Super Mario costumes, and he can be any Nintendo driver that he'd like to be! Nintendo officially licensed, this costume is constructed as a plush polyfoam cart that fits around the waist. The cart stays in place with adjustable suspenders, and the best part is that the wearer can use a Mario costume—or just wear their regular clothes! The plush cart features printed details, like the M logo and Mario Kart branded tires. 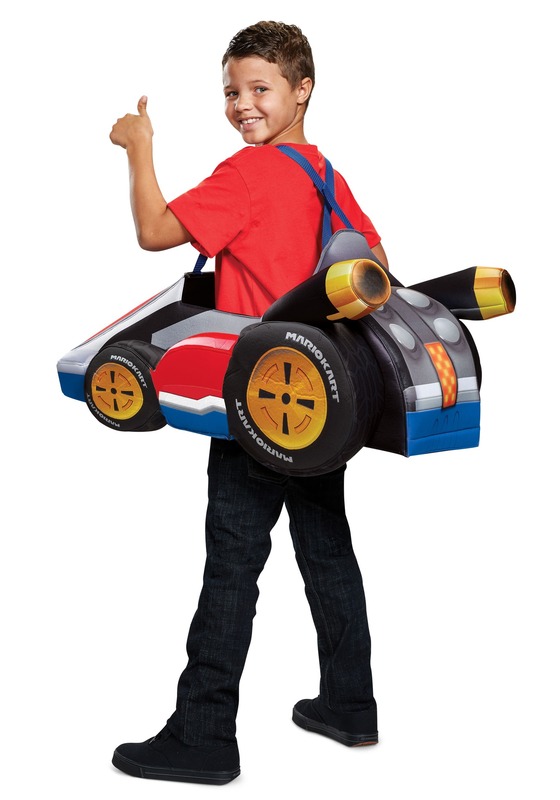 Boys and girls alike are sure to love this Super Mario Kart Ride-In Costume For Kids. We also carry Ride-In Costumes for Luigi and Princess Peach's Karts, too, so he or she can get all of their friends involved in the fun! Set up a backyard race course, and we're sure the fun will be just as intense as in the game!